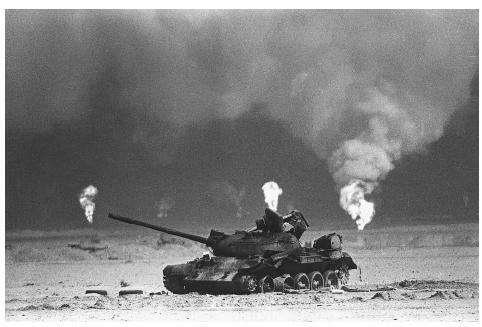 An Iraqi tank rests near a series of oil well fires in northern Kuwait during the 1991 Persian Gulf War. Hundreds of fires burned out of control, casting a pall of toxic smoke over Kuwait before firefighting companies, mostly from the United States, extinguished the last fire months later. contains about 9 percent of the world's total proven oil reserves, and petroleum revenues account for 95 percent of its export earnings. Ignition of oil well fires also created a serious threat to environmental and human health in the Persian Gulf region. The Kuwait oil fires burned for more than eight months, consuming an estimated five to six million barrels of crude oil and 70 to 100 million cubic meters of natural gas per day. Between late February, when the first fires were ignited, and November 6, when the last fire was extinguished, smoke plumes containing a hazardous mixture of gaseous emissions and particulate matter engulfed a downwind area as large as 150 by 1000 kilometers. The geography and climate of the Persian Gulf region affected the distribution of the oil well plumes, as well as the severity of their effect on human populations and natural ecosystems. Though Saudi Arabia and Iraq border Kuwait's petroleum fields, the region's strong prevailing northerly winds ensured that relatively tiny Kuwait bore the majority of the fires' ill effects. Uneven heating of the land and sea surfaces created local atmospheric inversions during the summer months that trapped smoke in the lower atmosphere, and occasionally caused the plumes to blanket the Kuwaiti land surface. Violent sandstorms, driven by intense summer winds, mixed sand and dust with the smoke plumes. Kuwait's most productive petroleum reservoir, the greater Al Burqan field, accounted for the majority of the smoke, and for the greatest amount of incinerated oil. Saddam Hussein's Republican Guard set 365 of Al Burqan's approximately 700 wells on fire, and high subsurface pressures kept the fires burning despite heroic firefighting efforts. The Al Burqan fires also presented the greatest risk to human health because of the field's proximity to Kuwait City and the coastal towns where most of Kuwait's approximately two million inhabitants reside. In general, smoke produced by burning unrefined petroleum contains a mixture of gases and particulate matter including carbon dioxide (CO 2 , carbon monoxide (CO), sulfur dioxide (SO 2 , nitrogen oxides (NO x , volatile organics (VOCs), polycyclic aromatic hydrocarbons (PAHs), hydrogen sulfide (H 2 ), acidic aerosols, and soot. (Soot is composed of solid particles embedded in tar.) Non-toxic carbon dioxide accounted for approximately 96 percent of the relatively clean-burning Kuwaiti crude oil smoke. The other chemical elements and compounds in oil well smoke, however, can be toxic, carcinogenic (cancer-causing), and otherwise hazardous to human health, as well as ecologically and climatically disruptive in relatively small concentrations. Airborne measurements above the Al Burqan fires in May and June 1991 found that particulate matter and gases made up equal parts of the fires' non-carbonaceous emissions. The Al Burqan wells tap Mesozoicage limestone, dolomite, and sandstone layers containing high-grade crude oil and salt deposits, geologic factors that account for the fairly low concentrations of toxic emissions, and for the presence of salt crystals in the smoke plumes. Considering the dramatic appearance and scale of the Kuwait oil fires—satellite and space shuttle images showed the plumes extending across the Arabian Peninsula and Persian Gulf, and the smoke blocked the sunlight from large areas for weeks at time—the environmental and human health effects of the fires were much less significant than expected. The largest and longest-burning fires, like those at the Al Burqan field, burned crude oil with low concentrations of potentially harmful impurities, and the "dirtiest" fires, typically pools of crude oil at the surface, were quickly extinguished. Atmospheric inversions kept the plumes close to the land surface where rain droplets and wind-blown dust particles could quickly cleanse harmful particulate matter, organic compounds, and heavy metals from the atmosphere. In fact, numerous studies found that concentrations of most harmful airborne chemicals like VOCs, PAHs, and heavy metals were lower in Kuwait City and at American military bases just miles from the fires than in major cities in the United States. Concentrations were also below levels recommended by American health and industrial regulators. The smoke did contain high levels of particulate matter that may have caused some of the respiratory problems that Kuwaiti residents and Gulf War soldiers reported as symptoms of so-called "Gulf War syndrome." Fears that the plumes would inject soot and sulfur dioxide into the upper atmosphere and cause global cooling or widespread acid rain also did not materialize. Kuwait has largely recovered from the socio-economic, environmental, and public health effects of the 1991 oil fires. However, the fires did leave a legacy of more subtle impacts, including long-term environmental damage and chronic human disease. Damaged wells have leaked large amounts of oil into pools on the land surface that threaten fragile desert ecosystems and present a human safety hazard. Furthermore, the Iraqi army set a precedent during the 1991 Gulf War by introducing oil fire ignition as a military tactic. Military forces and threatened nations may face the specter of oil well fires in future armed conflicts in the Middle East and other petroleumrich regions. Energy Information Administration, U.S. Department of Energy. "Country Analysis Briefs: Kuwait." August 17, 2002. < http://www.eia.doe.gov/emeu/cabs/kuwait.html >(January 4, 2003). National Defense Research Institute. "A Review of the Scientific Literature as it Pertains to Gulf War Illnesses. Volume 6. Oil Well Fires." Dalia M. Spektor, Editor. Rand. 1998. < http://www.gulflink.osd.mil/library/rowl/contents >(January 4, 2003). Public Broadcasting Service. "Last Battle of the Gulf War: Oil-Well Fire Smoke." Frontline online. 1998. < http://www.pbs.org/wgbh/pages/frontline/shows/syndrome/analysis/oilwell. tml > (January 4, 2003). Rove.To. "457 Shuttle Images of Kuwait." Images from NASA. 1998. < http://rove.to/kuwait/ >(January 4, 2003).